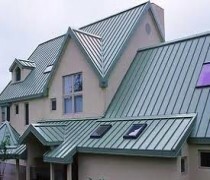 Dillon Bros. Roofing is proud to offer a wide range of metal roofing products for your residential or commercial project. We offer the “shingle style” 3 foot interlocking Katola system or full length panels in many different profiles including standing seam panels, all by STEEL TILE ROOFING. We also offer the all new BUCHNER ALUMINUM SHINGLE in a wide range of colours and trims.